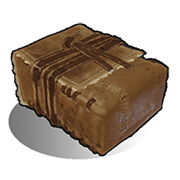 Small stashes are a very useful tool in the early game, especially when saving enough resources to build a starter base, or hiding your key to your door. Place it where you want it, fill it with up to 6 different items or stacks of items, and interact with it to bury it. After staring at the stash's general location for a couple of seconds, the stash will rise out of the ground and will be able to be accessed again. Stashes can be placed under foundations and deployables. This method of storage is a cheap and easy way to hide loot. Hidden stashes can be heard in the loading screen when you join a game or respawn. Depending on the rate at which you accumulate scrap it might be worthwhile to stash away items that you plan to research later down the line.